Pirates, orcas and penguins leap from the pages of the 22 books picked as finalists in the 2015 New Zealand Book Awards for Children and Young Adults. 2015 is the 25th year of the New Zealand Book Awards for Children and Young Adults, and the judges have just announced a great line up of finalists. These are the best books written by New Zealanders in the last year, so best you go and grab them off the library shelves. Do you want to help choose the winners in the NZ Children’s Book Awards? Be part of the Children’s Choice voting and have your chance to vote for the NZ books you think are the best. Did you know that Prince George will receive a copy of each of the winning books? He’s going to have an amazing collection of great NZ books! The winners will be announced on the evening of Thursday, 13 August at Government House in Wellington. Apirana Taylor: Saturday 3st January, 11am – 12pm, Wellington Central Library. Bring the kids along to a special story session with renowned author, actor and storyteller, Apirana Taylor. Known for his charismatic and engaging style, Apirana will tell traditional tales accented by taonga pūoru and whai (string games). Join us at Newtown Library for a Waitangi day themed session of our regular storytimes in te Reo Maori. 30mins of stories, rhymes, waiata and fun! Suitable for 3-6 year olds and their whanau. Join us in the Children’s section for a special te Reo Storytime with a Waitangi Day theme. 30mins of stories, rhymes, waiata and fun! Suitable for 3-7 year olds and their whanau. These events are free and open to everyone. Bookings not required. More Information. Kōhunga Kōrero – monthly storytimes in te reo Māori are starting next week! 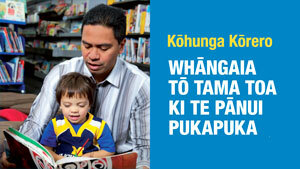 Head along to the library for 30mins of stories, waiata, rhymes and fun, and it’s all in te reo. It’s all free, lots of fun, and perfect for 2-6 year olds and their whanau. The first session is at Miramar Library, 2pm, on Tuesday 27th January. You can find the schedule at our children’s event’s page, also check out the library’s event calendar for specific dates. Whakanuia te Wiki o Te Reo Māori! Nau Mai ki te Māwhai Tuhituhi! Mōrenā koutou katoa! Hei te ata nei kei te whakatūwhera mātou i te whārangi ipurangi mō te Māwhai tuhituhi, tā koutou pakiwaitara tuhituhi ā-ipurangi. Kua oti kē i te kaituhi rongonui haere nei a Paora Tibble te whiti tuatahi te tuhituhi, ā, māu e whakamutua – āpiti atu ō tuhituhi ki te pakiwaitara ia rā, hei te 21-25 o Hūrae. Āpiti tō tuhi hei te wahanga tuhi ki raro nei, uru ki te whārangi o te māwhai tuhituhi hei te patohia i te pikitia “māwhai tuhi” ki raro nei ki tetukuna i tō tuhi ki a mātou. Ka whiriwhirihia kotahi te whiti ia rā hei wini i te taonga mo te rā, ki te wikitoria i te taonga nunui pea, ā, ki te hono ki te pakiwaitara mo te whiti o te rā. Tukuna mai ō whiti – kia tuhi! Ānei te whiti tuatahi… me aha inaianei? Kātahi ka weto te pouaka whakaata! Ka weto ngā raiti o te whare! Kua pō uriuri. Daniel’s Matariki feast by Rebecca Beyer and Linley Wellington. Daniel is a new boy at a school. His teacher Stacey introduces him to the other boys and they go and pick pumpkins from the school garden. Back inside the Teacher talks to the class about Matariki and the feast they are going to have if the pumpkins are ready. The class talk to Daniel about Matariki and he goes home and talks about it with his family. His mother knew about Matariki as her Granny used to watch the sky for it. What happens next is really lovely. Child of Aotearoa by Melanie Drewery, illustrated by Bruce Potter. This is a very lovely story about the different Peoples coming to Aotearoa. It starts with the first Maori arriving and then goes on to other races arriving here. People travelling through and settling here in Aotearoa. The sons and daughters of this land grow up and have children of their own and they grow up all Children of Aorearoa. This book has lovely pictures. This is a story about a family who have a surprise visit from their Grandma. There is going to be a surprise happening for them and they have to wait and see. This is really exciting event happening the next day Matariki and the whole family are getting together for it. 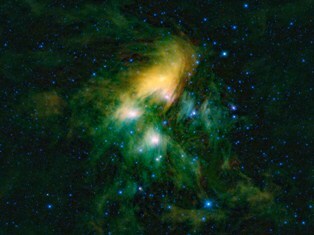 Matariki andthe special events are explained in this story. 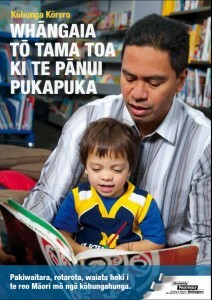 Beautiful pictures and the book is available in both English and Te Reo. The Treasure by Melanie Drewery illustrated by Bruce Potter. This is the story of a mother telling her child about a beautiful teasure that she has. He has to try and guess it. Can you? Beautiful pictures and a lovely story. We have it available in both English and Te Reo as Te Taonga. Whakanuia Matariki, Whakanuia te Tau Hou Māori – Celebrate Matariki – Celebrate the Māori New Year! Matariki starts this year on 28 June, but we are kicking off early with a special preschool storytime series all about Matariki, myths and outer space. The series will run for four weeks at Cummings Park Library, Ngaio and starts on Wednesday the 11th of June at 10.30am. Preschoolers are encouraged to bring along something creative they’ve made to do with Matariki, myths and outer space. It could be a star, a rocket ship, a woven kete, a taniwha, a Matariki kite or anything related to Ao Māori (Māori world) made with or without the help of parents and caregivers. All children who bring along art will receive a prize! We would love to create a starry night sky out of the preschoolers’ art in the children’s area. Whakanuia Matariki, Whakanuia te Tau Hou Māori. Ka timata a Matariki a tēnei tau a te Rātu 28 o Pipiri, heoi ka whakatō mātou i te kakano a te 10.30 i te ata, kei te wharepukapuka o Karori. Nau mai haere mai ki a koutou katoa. Ka pāhekohekotia mātou mō ngā pakiwaitara, mō ngā waiata, ki te whakanui tēnei wā whakahirahira. Come along to share stories and songs related to Matariki, and to learn about this very special festival. Ideal for older preschoolers, but everyone is welcome.